Cotta is a term used to refer to a type of surplice that sometimes features lace decoration or embroidered borders. The plain garment is meant to be a type of miniature alb, often thought of as a symbol of the white garment received at baptism. 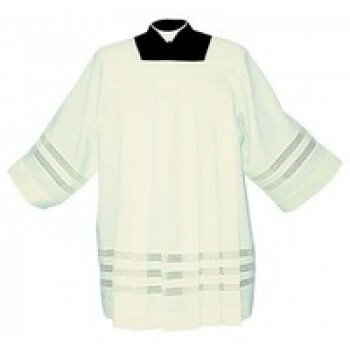 The cotta may be worn by any cleric, lector or acolyte. 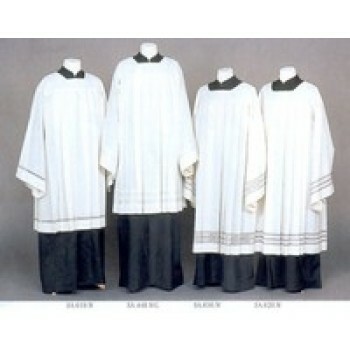 It is also sometimes worn by altar servers during a liturgical service. 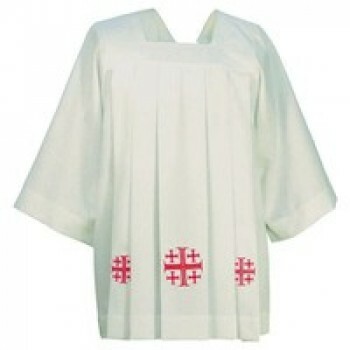 The bishops cotta is usually worn under the stole by deacons or priests during ceremonies or certain celebrations. On occasion, a cope is worn over the cassock, cotta and stole. The cotta is not usually used in the dress of higher ranking prelates such as the Pope, cardinals or canons. While the cotta is considered a sacred vestment, it does not require benediction before being worn. Matthew F. Sheehan offers several styles of cotta to choose from in full and abbreviated lengths. Our cottas are available in plain or embroidered designs to suit the style and demands of the church. Order the cotta that suits your needs today and take advantage of our low prices and incredible customer service to bring the high-quality clergy cottas you want to your church.